New release! Pour into me! Kavahna Webb was born and raised in the city of Detroit. She began singing at the age of 4yrs old in the children's choir at Christian Tabernacle. At age thirteen Kavahna joined the Mosaic youth theater of Detroit. She recorded her very first demo with Detroit producer Marcus Devine at age fifteen. That demo was heard by some of Mary J. Blidge's management and afforded her the opportunity (after graduating high school) to relocate to New York to ghost write for several Major artists. Throughout Ms Webb's teenage years she worked developing worship teams. In 2011 Kavahna enjoyed singing with Triumph Churchs Dream Team. Being apart of this team has afforded Kavahna the opportunity to sing with or open for just about every major Gospel artist in the industry including, Deitrick Haddon, Ricky Dillard, JJ Hairston, Mary Mary, Kurt Karr, Donnie Mcclurkin, Kirk Franklin and many more. Among her accomplishments Kavahna sang the national anthem for the Detroit Tigers opening day game and received a standing ovation. 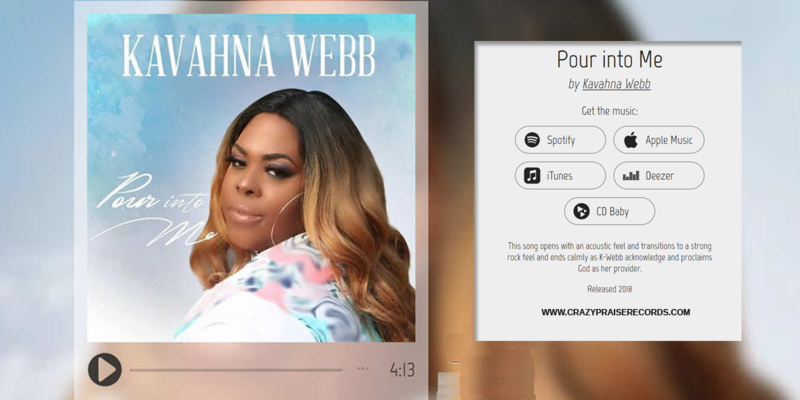 In 2013 Kavahna released her very first single entitled "So Amazing". Just as the project began to gain traction, she was injured in a car accident. After much prayer and physical therapy Ms. Webb resumed her passion. Kavahna is currently associated with Crazy Priaise Records and is preparing to release new music in 2018. She is excited and always ready to be a blessing to the Kingdom of God!